ANITA 1211 LSI (also known as the 1211D). Display is 12 digits, amber Panaplex type. Uses single Rockwell A1150PB IC. 222 mm X 135 mm X 88 mm (9" x 5.5" x 3.5"). From about 1973 (has circuit board dated March 1974). Note - One key cap is missing in the machine photographed. Note that some of the later models with displays may be referred to with or without a "D" designation, to distinguish them from the printer models with a "P" designation. For example this 1211 LSI was also referred to as the 1211D. Inside showing the circuit board and the single Rockwell LSI calculator integrated circuit on the right. 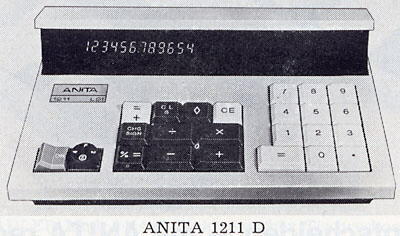 Catalog photograph of the Anita 1211 LSI where it is referred to as the 1211D to distinguish it from the 1211P version with printer instead of display, though the label on the calculator shows 1211 LSI.